I am editing the Canvas Challenge class for a training. Is there a way to make an editable copy of a Google form that's embedded into the rich content editor? Kristen Sauber, I have the challenge downloaded to a course and I couldn't find the form you are referencing. Could you attach a link to the Google form you're talking about? Kristen Sauber if you could share the url to the form, we'd be happy to give you edit rights to a copy of it. Thank you both, Kona Jones and Scott Dennis! The page is The Certificate of Awesomeness. I truly appreciate your offer to help! Wow, that is pretty... well... Awesome! Scott can you let me copy that as well? Yep, that is, um, Awesome all right. I'm not finding it in my Google docs, which I'm guessing means that it was added long after I had anything to do with the course. More recently Biray Seitz has been managing and curating these resources. Biray Seitz, do you have access to this form? 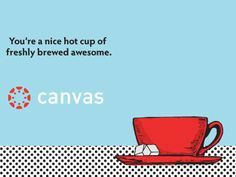 The Canvas Challenge was released into the wild about two years ago and, as we had hoped, has been copied and modified many times for local use. Kristen Sauber, where did you get the copy you are working with? There's a bit of a breadcrumb trail.....I went to the "Welcome to Canvas" course. Where I found a Google drive file of courses to share. In there was a copy of the "Canvas Challenge" course. When I added it to my drive it recorded that The specified item was not found. added the course in November of 2014. I'm not sure if he may have added the form? You're right. The one I posted earlier somehow linked to my domain. I downloaded the course again and the the URL I have for the original form is now: https://docs.google.com/a/instructure.com/forms/d/1Nn0Pn4bOLFD0kIpsdda9tiBjlhMoqPYiLcoodIT2quw/viewform. I'm not sure if this tells us anything new. I truly appreciate your help with this! I just requested access to that version of the form. Will let you know what I find out. Yes, I revised the Canvas Challenge course with the Certificate of Awesomeness Google Form that lives in my google drive. Have at it! Thank you all so much! I'm lucky to be part of such a supportive community!